We’re not even halfway through winter, so that means plenty more chilly days that can keep kids indoors for play and leisure time. A colorful picture book is a perfect way to pass the grayer days of this season. Already in 2019, we’ve seen several exceptional picture books published for children, but we wanted to look back at some of the best releases from last year. You can plan on loading up with these titles, and more, on Saturday, February 2nd – that’s Take Your Child to the Library Day. What does love sound like? What does love look like, or feel like? The words of Newbery Medal-award winning author Matt de la Peña and the evocative illustrations of Loren Long create a poignant portrait of a universal necessity in life. These simple images and words underline the importance of interpersonal affection as a means of nurturing the wellbeing of any human, be they a toddler, a kindergartner, or even a grown-up. Through mixed-media art (painting, drawing, photography and embroidery), the Pura Belpré award winning illustrator creates a memoir that depicts her experience, in 1994, of emigrating with her son from Mexico to the U.S. It’s a powerful and vividly rendered story about finding a voice, a creative voice, in two different languages. 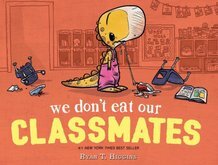 Higgins enters the domain of manners, civility, and encouraging empathy for the feelings of others, through a hilarious and cutely subversive conceit when he places Penelope Rex into a school full of humans. Here our precocious little t-rex was, all too eager to make new friends on her first day of school, only to underestimate her inevitable urge to, well…eat these tasty new peers. Let’s learn (and laugh a bit) about why that’s wrong! The Pulitzer Prize winning author of The Brief and Wondrous Life of Oscar Wao tells a story that follows young Lola at her school where everyone is “from somewhere else.” Leo Epinoza uses a vibrant color palette to augment a story where the littlest readers can imagine a deeper sense of identity and heritage through exploring the memories, however joyous or heartbreaking, preserved and passed on by our families. It’s hard for young children to realize that the things that they might be most self-conscious about are exactly what make them special. Edward the Giraffe worries that his neck is “too necky” because everyone stares at it. There’s a fun fold-out page that shows readers just how useful Edward’s ostensible eccentricity proves to be. It’s sort of Rudolph-esque, but charmingly more droll in the narration. This book glimpses the South African leader and human rights advocate through a perspective that can be relatable for young readers. Two great-grandchildren of Nelson Mandela request a story from their grandmother, arranged across 15 specific questions about his life. As more is revealed to them about their “Grandad,” they can begin to see how they can carry on his legacy. Perfect for this year’s theme for public libraries’ Summer Reading programs (“A Universe of Stories”), Slade’s story encourages young readers to think deeply about their own hopes and dreams. As Annie gets ready for her school’s ‘Career Day’ presentation, she graciously accepts tokens from her family, a notebook, a mixing bowl, a backpack, sneakers, because they each have their own idea of what they think she wants to be…, lo and behold, she combines the items to make a costume that represents her true aspirations. Comparatively speaking, a much more meditative reading experience for little ones—Blackall’s beautifully illustrated and poetic portrayal of a sturdy lighthouse is meant to have each page turned at a slower rate than most picture books, and evoke a sense of calm and even quiet majesty, as we learn about the role of a lighthouse keeper. Ships glide by, guided by the light, while the lighthouse keeper carries on his tasks while boiling some tea for his family, inside, as the waves tide past. O’Hora captures the quirky and sometimes spastic energy of kitties with his endearing main characters—who happen to look a lot alike! That doesn’t mean they like the same things though—and that spells trouble when they are mistaken for one another by their respective owners. This playful and brightly colored picture book can emphasize how everyone’s unique sensitivities and habits are part of what defines their individuality, as well as show them that even a house pet can have their own proclivities, be it an affinity for music, or a taste for chips. Our final entry is geared more towards 8-12 year olds; this historical novel from lauded picture-book author Cline-Ransome spans more than 100 pages and portrays an 11-year-old Langston Hughes leaving rural Alabama in 1946 after the death of his mother. By way of a biography for the younger years of the celebrated Harlem Renaissance writer, Cline-Ransome can also give middle-grade readers a poignant depiction of the Great Migration.